MEDFORD, Ore., April 27, 2018 /PRNewswire/ -- Library Systems & Services (LS&S), which partners with local governments across the country to provide library access, service and support, is thrilled to announce the return of the fourth annual Jackson County Library Services (JCLS) Medford Comic Con. This free, family-friendly event for fans of the arts, technology and popular culture will take place on Saturday, April 28 through Sunday, April 29 in downtown Medford. Medford Comic Con is dedicated to promoting and fostering lifelong learning, connecting people and celebrating family and community. The event's mission is to encourage literacy and innovation through popular media, arts, literature, science, technology, fantasy, science fiction, gameplay and design in the form of workshops, programming and exhibitions. Event organizer, Assistant Director of Branches & Youth Services for Jackson County Library Services, Laura Kimberly, has watched Medford Comic Con grow substantially over the last four years. "Medford Comic Con has significantly enhanced connections with the community and downtown Medford businesses. There's so much energy and excitement around it, and for good reason," she said. "Whether you've attended comic cons before or are considering coming for the first time, we have something for everyone." This year's Medford Comic Con will host many fun and engaging activities for all ages, such as Harry Potter World, drone racing, Geocaching, the Aetheric Telegraph Company, Ltd., Pokémon League, Cosplay Karaoke, and more. Panels and workshops range from cosplay to morals in comics discussions. More than 70 vendors will offer everything under the comic-universe (Comiverse), including rare comic books, original art by local artists, metal art and cosplay props. Ten food trucks will be parked along South Bartlett Street. A plethora of events and programs abound. Visit http://jcls.org/mcc for more detail. 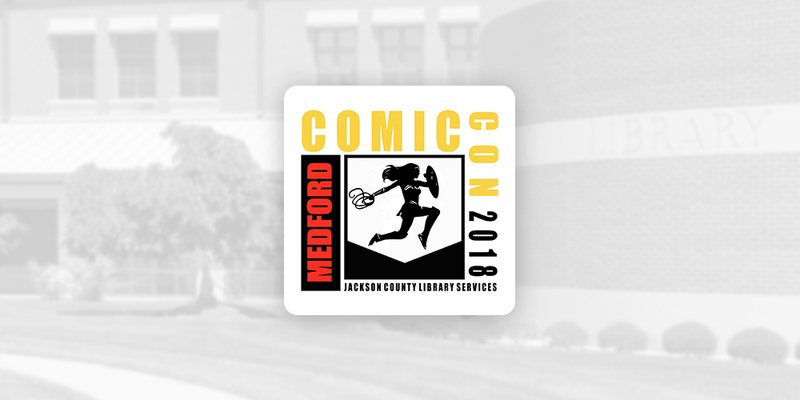 For the event, Jackson County Library Services will be offering a commemorative library card with a superhero theme to celebrate Medford Comic Con 2018. There will be many opportunities throughout the event to sign up and receive a new library card or exchange existing library cards for free. Sponsors include Jackson County Library Services, Jackson County Library Foundation, Rogue Community College, Southern Oregon University, Friends of the Medford Library, Astral Games, What To Do In Southern Oregon, Central Art Supply, Blum Family Foundation and many more. "Among all of the activity, attendees will be able to find, meet and capture a photo with their favorite superhero and walk away with a commemorative superhero themed library card," added Kimberly. "Who knows, maybe the next Stan Lee will be in attendance." Follow & Engage: #MedfordComicCon on Facebook, #medfordcomiccon on Twitter, medfordcomiccon on Instagram and medfordcomics on Snapchat. Library Systems & Services (LS&S) has partnered with local governments and libraries to drive long-term library vitality and growth for more than 35 years. Driven by a social mission to provide excellent library service, LS&S offers a full range of library operation and management services, which comes to life in 83 communities across the U.S. Leveraging more than three decades of library experience in best practices and efficient methods, LS&S is leading the charge in library excellence to better reach, engage and serve patrons and communities.